Among the first victims of the tsunami of the 26th December, 2004 were the aboriginies of Nicobar Islands, located less than 100 miles (150 km) north of the epicentre. The official death count was 4500 people, but other estimates are much higher. 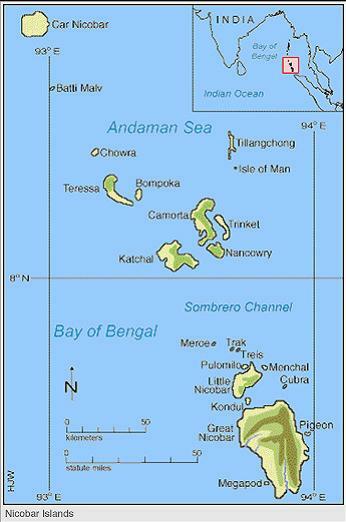 the Nicobar Islands comprise 19 islands in the Bay of Bengal and are inhabited by tribal people of Austronesian descent. This means that they are more closely related to the Malays and Indonesians rather than Indians. 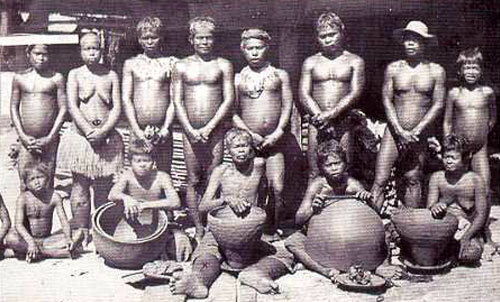 The various tribes each have different names but outsiders call them Nicobarese. The people there call themselves "Holchu", which means friends. 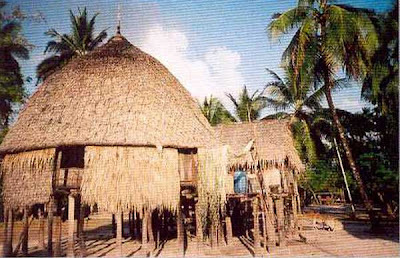 The typical village consist of round huts with dome roofs clustered around a community centre called “elpanam” where feasts and meetings are held. The houses are on stilts. Access is via ladders and these are brought into the houses at night. 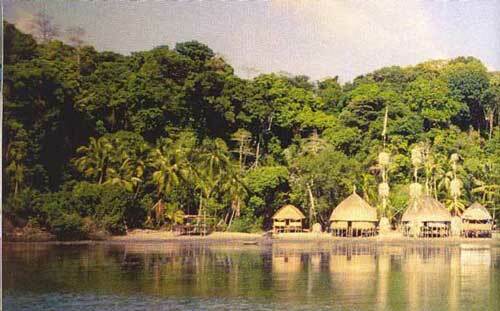 "On the Nicobar Islands, men and women have approximate equal status. The women have a lot to do with their own choice of husbands, and after marriage they are free to live with either of the couples parents. The Nicobarese men value the women economically because they not only take care of household duties, but also tend to the plantations and gardens”. “Most of the people of the islands are of the Christian religion, which was taught to them by a man named John Richardson who translated the New Testament into Nicobarese. 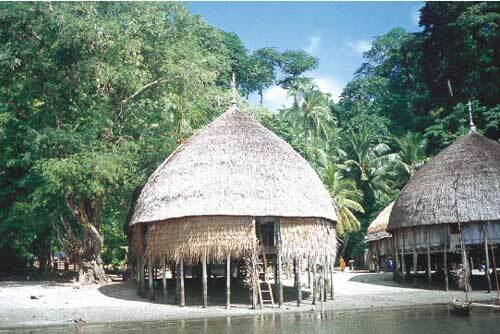 Besides Christianity, other Nicobarese follow the traditional religion of the islands, which is animistic in nature. They believe in spirits, ghosts, and the existence of the soul. A person becomes a ghost after their death when their soul leaves their body and the ghosts of all the Nicobarese are all around the islands. They believe that the spirits are responsible for all of the occurrences on the island, Shaman are called upon to handle to bad spirits”. “The Nicobarese have a traditionally horticultural economy, they base their monetary existence on the growing of coconuts, pandanus, areca palms, bananas, mangoes, and other fruits. They also hunt, fish, raise pigs, make pottery, and make canoes”.